Nest Update August 5, 2013 - More Good Things!! Well, I promised you guys a blog and here it is! It’s tough to write one of these when my muses have “flown the coop” so to speak. But I’ll guess I’ll give it the old eagle nest try! We saw a fair bit of action in the week between the last daily blog and the cam shutdown. All of Razzle’s vids from that week are in the post below this one, starting with the oldest first. Harmony and Peace are having fun learning new lessons in Survival 101 and Intermediate Flight Tips 206. They have also been exercising their vocal cords squeeing for Mom or Dad to bring them some cheetos or another tasty treat. Even when they were far away from the nest they could be heard yelling at anything and everything that crossed their path. Hope they learn to be quiet sometimes so they can sneak up on their prey! We had a great chat session on Saturday last and Peace even put in an appearance for us at the beginning of it. She flew off after a bit and we chatted and waited for someone to grace us with their presence. Wouldn’t you know it the nest was empty until 2 minutes after we closed the chat for the day. Dad showed up and posed for us for a bit and BBC was kind enough to keep the cam up until he left. It was good to see him standing still after all those hit and run food deliveries. On the last day of live cam LovebirdsJGA set up a Facebook page where all the chatters can keep in touch while we are down. 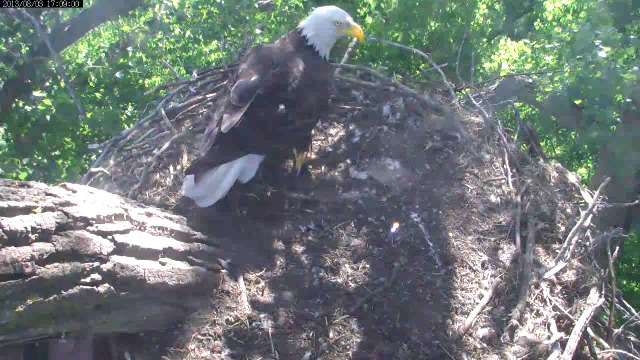 It’s here: MNBound Eagle Viewers. It is a closed group but all you have to do to join is click the “Join” button and one of the admins will add you to the group. It’s a good place to hang out and remember all the great things that happened during the season. Lovebirds has also posted all of her screencaps for the season here: MN BOUND 2013 NESTING SEASON. There are a ton of pages there and it may take you until the cam comes up again to see them all. She also made a movie of some of them: LOVE BIRDS - A PHOTO MONTAGE. It’s a large movie but well worth the wait for it to download. Thanks, LovebirdsJGA, for all the hard work you have put into the Facebook page, the photo archive and movie. You have made us all that much richer. We hope to have the cam up for next Saturday’s chat but for the 3 weeks after that the server that brings the cam to the net will be at the local county fair and the Minnesota State Fair streaming a cam for the 4-H barns at the fairs. BBC does this every year and its one of the reasons why BBC has to shut down the nest feed every year. 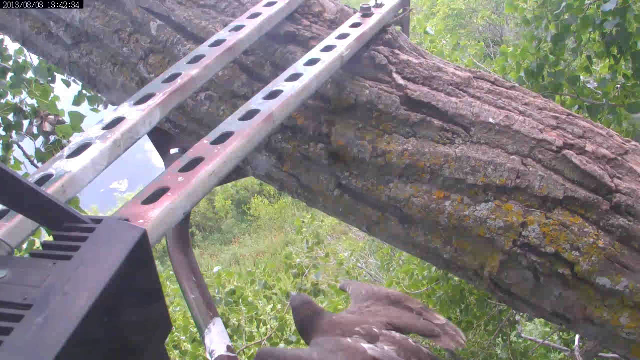 Also, BBC hopes to go up the tree in early October to retrieve the cam and refurbish it for next years season so we will be without the cam on the Saturday chats for however long that takes also. 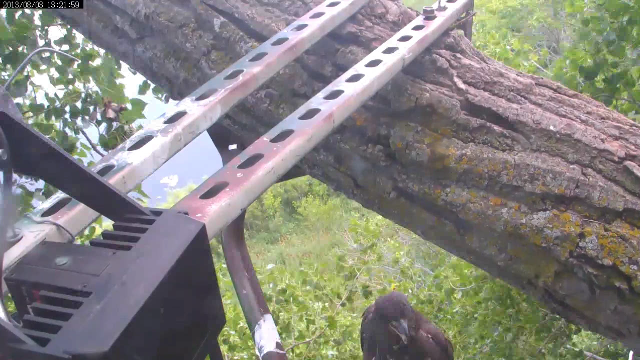 But we look forward to having full functionality back after the cam is replaced in the tree and it will be good to have a clean dome to view through again. In case you haven’t noticed BBC has been bringing up the cam when the kids are on the nest. It has happened a couple of times and we hope it continues to happen. You can see the vids at the Ustream page of what they happened to catch on the nest. Thanks BBC, we love it when you do that!! Razzle made a vid of Dads appearance on Saturday and we have a couple of scaps from the day also. Dad shows up late as usual. Could you make it a bit earlier next week?? The back 40 looks pretty good today! Don't look at me, kid! I'm outta gas for this year! Guess I'll have to find Mom to go get it!! Whoopee! Love this flyin' stuff! Let's see, new carpets, a power wash, higher rails next year and she wants a new deck. I better get my order in at Sticks Depot soon! No Grandpa, I ain't falling for the "Pull my finger" trick!! Thanks as always to Razzle and BBC for the pics and vid. I’ll see you on the other nests and next Saturday right here at our Home Sweet Home nest! P.S. Pass the word to all your eagle friends I got off my nest and posted another blog. Thanks! !